Click the image below to view video of cleanup effort. There is a growing public outcry over the handling of the spill from the 401 accident last Sunday from a tanker carrying over 50,000 litres of Jet Fuel. Since that time a lot of questions are being asked about the handling of the situation. I myself called the Ministry Of Environment Tuesday afternoon and they still did not have any public press release available with any information (although to be fair by the end of day Tuesday they did contact me with the info). The CBC is reporting HERE that ice fishing at Shade’s Mill has been cancelled by the GRCA ‘until the impact of the fuel spill on the reservoir is determined’. Green Party leader Mike Schreiner is questioning the response to the spill in a CBC article posted yesterday (read it HERE). “The accident happened on Sunday morning, but from my understanding, the ministry cleanup and containment didn’t start happening until Monday around noon,” Schreiner said. He said he’s concerned about the water and wildlife in the area. I think we would all like to know why there seems to be a day and half delay in this cleanup effort. Apparently, although we are all assured wells are not affected, the Region of Waterloo has closed down two wells that serve the Shade’s Mill water treatment plant as a precaution – a luxury local residents of Puslinch do not have. 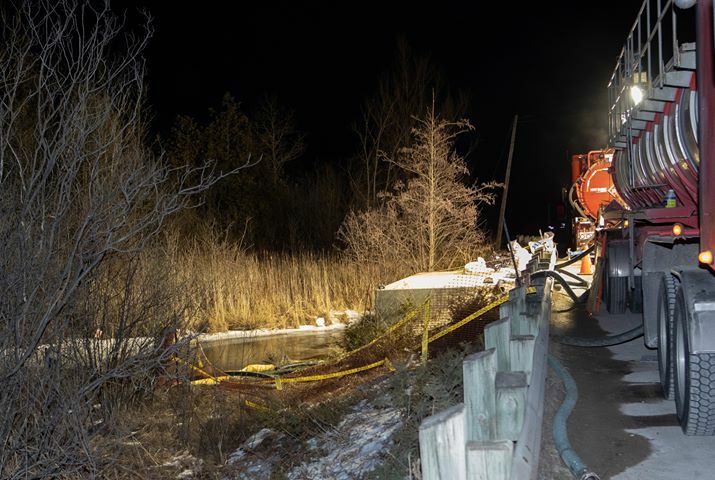 On Sunday, January 13, 2019 at 1:40 am Puslinch Fire was dispatched to the 401 east bound lanes at highway 6 north for a motor vehicle accident involving a fuel tanker and a second vehicle. The tanker carrying jet fuel rolled on its side and a spill occurred. The Ministry of the Environment, Conservation and Parks was notified, are the lead agency, and were on site as the cleanup began. Wellington-Dufferin-Guelph Public Health was notified and have spoken with the Ministry. 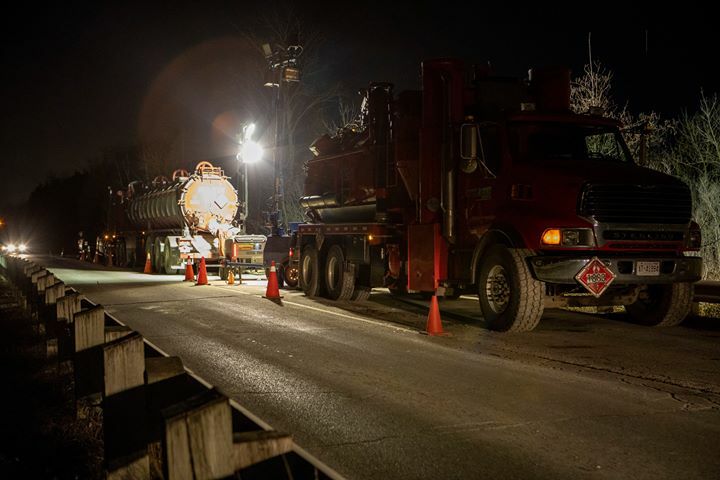 There are no concerns about fuel leaking into private or municipal wells. Residents can call Public Health at: 519.822.2715 x 4753 for more information. For status on the cleanup, residents can all the Ministry of the Environment, Conservation and Parks, Guelph District Office, Duty Officer at: 519.826.4256. 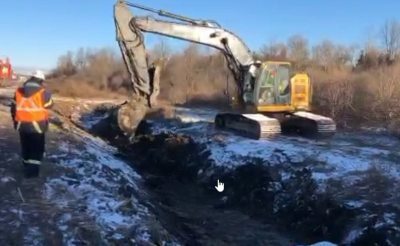 Below are some photos Mike White captured of Virginia Wright from CTV Kitchener doing a report about the clean up at side road 20 and concession 2.